Twitter has teamed up with the makers of budget messaging handsets Peek to launch a handheld Twitter device, in a move designed to get more people on Twitter. To most Twitterers their handheld Twitter device is their phone: their iPhone, Blackberry, N97 or any smartphone that has a Twitter app. So… in launching the $99 TwitterPeek, Twitter are clearly not targeting smartphone-owners. This probably shows Twitter trying to broaden their appeal beyond their current core audience of smartphone-owning Twitterati by finding new audiences. Like teenagers. Sarva said that the device could help open Twitter up to a new market, particularly the teen market, which has not adopted the microblogging service in the way it has other social networking sites. “Twitter die-hards will appreciate its ‘always-on’ instant tweet delivery and newbies will finally ‘get Twitter’ once they have TwitterPeek in hand. 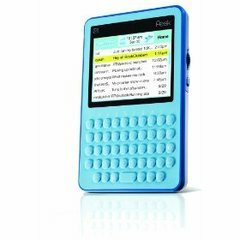 Equipped with a QWERTY keyboard and 2.7 inch x 4 inch screen it offers users unlimited tweets and direct messages and always-on instant tweet delivery. It will allow users to view links as plain text and Twitpic images. Unlike other Peek handsets, the TwitterPeek won’t do text messages or email. It runs on high-speed wireless data networks, 6 months are included in the intial down payment of $99 and after 6 months you pay $7.95 a month.